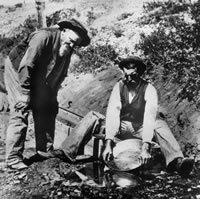 Gold panning in 1860s Montana. 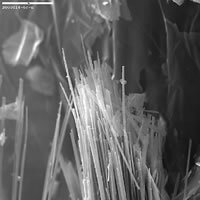 Electron micrograph of asbestos fiber from a site near Libby. 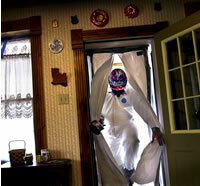 An EPA worker enters a sealed Libby home. Note: This article is a sidebar to this issue's feature story, "Where were the environmentalists when Libby needed them most?" 1916 — In an old mine shaft about seven miles from Libby, prospector Edgar Alley notices his candle causing a strange rock to expand; he's discovered veins of vermiculite, which contains tremolite asbestos. 1939 — Universal Zonolite Company takes over the vermiculite mine, processing the ore into insulation for buildings around the nation. 1956 — A state inspector takes air samples in the vermiculite mine and processing mill, and finds that "the asbestos in the air is of considerable toxicity." 1960s — workers handling the vermiculite begin to come down with asbestos-related illnesses. 1963 — Multinational conglomerate W.R. Grace & Co. takes over the vermiculite operation. Over time, the company improves working conditions to reduce the asbestos risk, but allows the exposure of workers and families to continue. 1980s — The Environmental Protection Agency conducts four studies that show the dangers of asbestos in Libby, but keeps them quiet. Mid-1980s — Ralph Nader's Public Citizen magazine and Montana newspapers report on asbestos-related illness in Libby and victim lawsuits against W.R. Grace. The national press ignores the story. 1989 — EPA bans most uses of asbestos nationwide. 1990 — W.R. Grace & Co. closes its Libby vermiculite operations. 1991 — Ruling on an industry lawsuit, the 5th Circuit Court of Appeals tosses out the EPA's asbestos ban, saying the EPA's cost-benefit analysis is flawed. The George H.W. Bush administration lets the issue drop. 1999 — Tipped by Montana environmentalists and lawyers, the Seattle Post-Intelligencer makes the Libby asbestos disaster a national story, forcing the EPA top dispatch a cleanup team. 2001 — W.R. Grace & Co. declares bankruptcy to shield itself from lawsuits filed by asbestos victims nationwide. 2002 — EPA declares Libby a Superfund cleanup site. 2003 — Federal Judge Don Molloy in Missoula orders W.R. Grace & Co. to pay $54.5 million to help cover the cost of the Libby cleanup. The company has appealed that verdict. 2004 — Insurance experts predict that Libby asbestos victims' medical bills will total $32 million during the next five years. W.R. Grace may pay only one-third of the cost. 2005 — Sen. Arlen Specter, R-Pa., introduces the Fairness in Asbestos Injury Resolution Act, which would collect $140 billion from asbestos and insurance companies to pay the victims' medical bills while making the companies immune from lawsuits. The bill wouldn't cover most of the Libby victims. 2005 — On Feb. 2, President George W. Bush, in his State of the Union Address, says, "Justice is distorted, and our economy is held back, by irresponsible class actions and frivolous asbestos claims — and I urge Congress to pass legal reforms this year." 1860s — Mining begins with gold rushes on banks of Libby Creek. 1911 — Family-owned J. Neils Lumber Co. relocates from Minnesota to libby, buying sawmills and, eventually, several hundred thousand acres of timberland. 1957 — J. Neils sells out to the giant St. Regis Paper Co., which later builds more sawmills. 1960s — Libby's economy booms, employing more than 1,300 in logging and about 2,000 in constructing the Libby Dam. 1976 — Local environmentalists organize the Cabinet Resource Group to fight risky mining proposals. Over time, environmentalists oppose heavy-handed logging and stop two additional dams. 1984 — St. Regis Paper Co. merges with Champion International, which liquidates old growth on the private timberland for short-term profits. 1987 — Kootenai National Forest logging peaks at 250 million board-feet per year. 1990s — Environmentalists' appeals and lawsuits, as well as insect outbreaks and wildfires, cause the Forest Service to reduce the timber cut in the Kootenai National Forest by more than 75 percent, to about 60 million board-feet per year. 1993 — Champion sells its local timberland to the giant Plum Creek Timber Company. Plum Creek finds a buyer for the sawmills, Oregon-based Stimson Lumber Co., which lays off hundreds of people and closes all but one of the mills. 2002 — Stimson shuts down the last sawmill in Libby, laying off 200 people, in part because of the skyrocketing cost of medical insurance for workers and families poisoned by asbestos. 2003 — Lincoln County leaders ask the Ecology Center to drop a lawsuit that has stalled logging on the Kootenai National Forest. The Ecology Center refuses, but Sen. Conrad Burns, R, passes a rider that allows some timber sales to proceed. 2004 — Five environmental groups file a new lawsuit challenging logging on the Kootenai National Forest. Other lawsuits challenge the same risky mine proposals that began in the 1970s. 2005 — Jim Hurst, owner of Lincoln County's biggest remaining sawmill, in Eureka, accounces that he'll shut down in May, laying off 90 people. He blames environmentalists for "obstructing" logging on the national forest.